Every year for his birthday my dearest Prudent Husband, Carleton, presents me with a new cake challenge. Angel food cakes have fallen and devil’s food cakes have been devoured, but the challenge and the presentation have always been fun for both of us. This year he selected the always-delectable Mexican specialty Tres Leches. Tres leches cake gets it’s name from the “three milks” in which the spongy cake is soaked to create the totally unique sticky-sweet sensation that makes this cake so beloved. You will usually see tres leches presented as a sheet cake with a maraschino cherry or twenty piled on top, but I wanted to try something different, so I turned it inside out, stacked the layers three-high, and complimented the cinnamon-vanilla flavor with honey drizzled on top of a crumbling of his favorite homemade Honeycomb Candy (so easy and fun to make, learn how here). I was concerned a super-moist cake like this might not lend itself to layering, but as you can see, it turned out beautifully. And deliciously. Microwave the sweetened condensed milk (cover with plastic wrap first) on medium-low for about 10-12 minutes, stopping to stir every couple of minutes, until it thickens and gets a teensy bit darker. 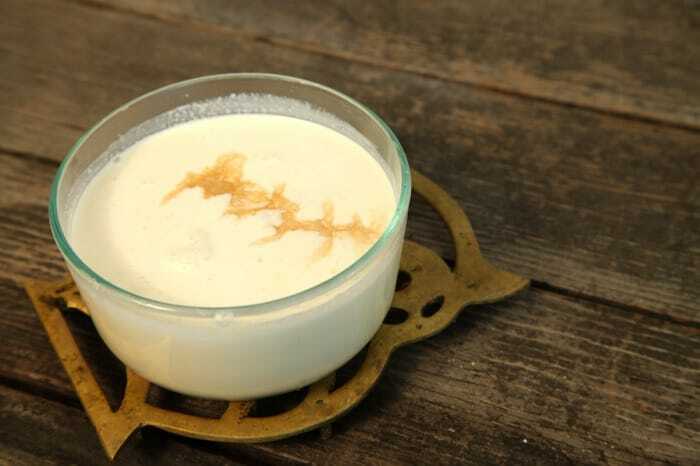 While that’s in the micro, pour the evaporated milk, 1 cup of cream and 1 teaspoon of vanilla into a large (4 cup) measuring cup or a bowl When the sweetened condensed milk is ready, whisk it into the cool milk mixture, then let the whole thing cool to room temperature. , then dust with a bit of flour. 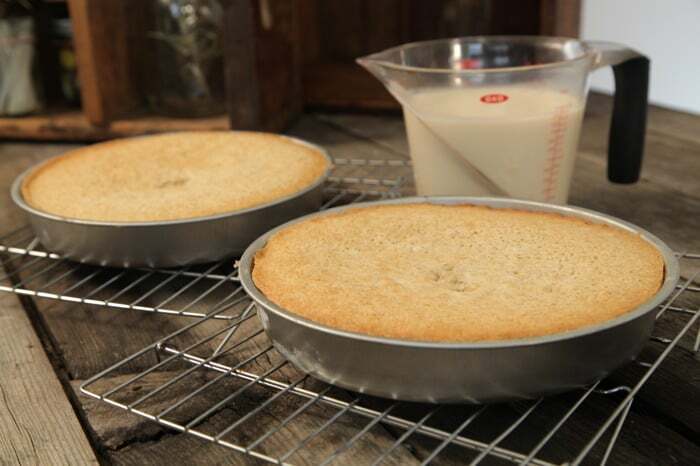 But honestly, if you want perfect looking layers, you should use a springform pan. In a medium bowl whisk the flour, baking powder, salt and cinnamon. On the stove, mix the milk, butter and 1 teaspoon vanilla in a small saucepan over low heat until the butter is melted. In the bowl of your electric mixer with the whisk attachment (or your hand mixer, or just your hand if you have serious stamina), whip the eggs on medium-high speed. 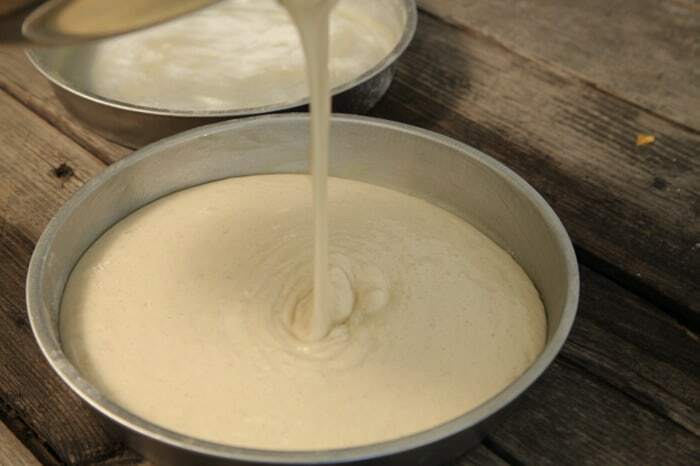 Gradually add the sugar, increase the speed and whip until the mixture gets very thick and fluffy, about five minutes. Reduce the mixer speed to low and add the milk/melted butter, mixing until combined, about 30 seconds. Add the flour mixture, beating until incorporated, about 30 seconds. Scrape down the sides and give it a quick high-spead 30 second beat to bring it all together and fluff it up. 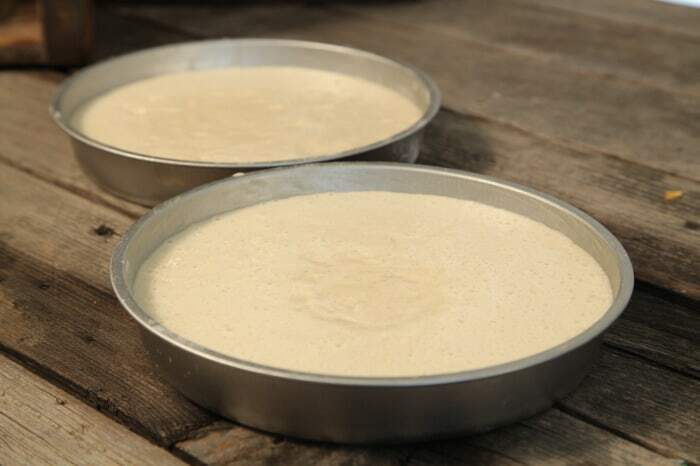 Now split the batter between your two prepared pans, then gently tap the pan on the counter to release a few bubbles/settle the batter. Bake at 325 until a toothpick inserted in the center comes out with a few crumbs attached, 35-37 minutes, rotating the pan halfway through baking. Let the cakes cool for 10 minutes before touching them. Using a skewer, poke about 50 holes in the warm cake (you do not need to poke all the way through).Now we are going to pour our tres leches onto the cake. DO IT SLOWLY! It needs time to soak into the cake. If you do it too fast it will spill everywhere. 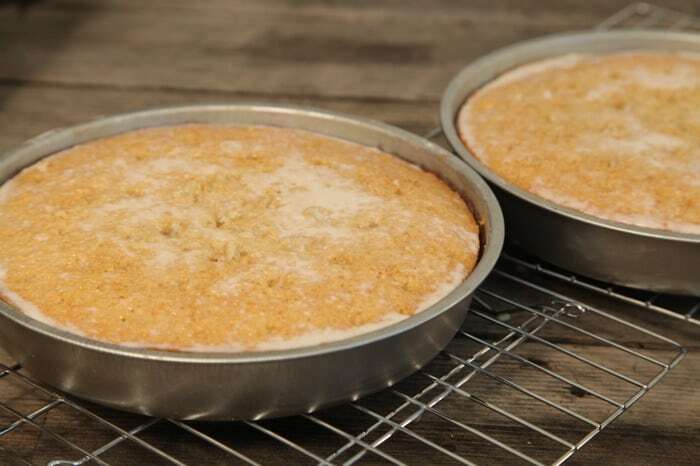 Let the cake sit to cool another 15 minutes, then refrigerate until the milk is completely absorbed and the cake has cooled completely, about 3 hours. Repeat the whole process if you want more layers like mine. With a whisk attachment, beat the cream, corn syrup, and milk for a couple minutes until stiff beaks form. Be careful not to overbeat. You could eliminate the corn syrup and just do a regular whip cream, but it will not hold it’s shape as well and will melt very quickly. When you are ready to assemble your cake, take your four layers out of the fridge for 30 minutes to let them get to room temperature. Right before serving, plop some frosting on your cake stand, then turn the pan over to plop the first layer on top of it and frost. Repeat for each layer. 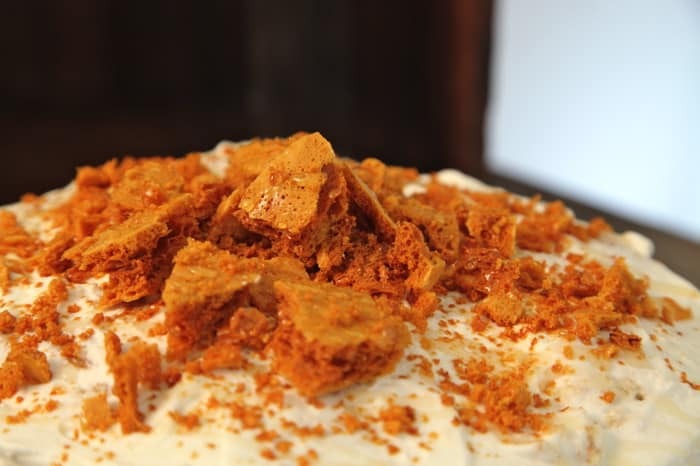 I liked the inside out look so I didn’t frost the sides of the cake totally, just smoothed frosting about in a messy manner, then crumbled my honeycomb candy on top of that, and drizzled with honey to finish. Oh Tres Leches is my husband’s very favorite cake! He requests one every year for his birthday! I love how your cake looks, I’ve never made one layered before, I was afraid the leches would make it to heavy and slide all over the place. 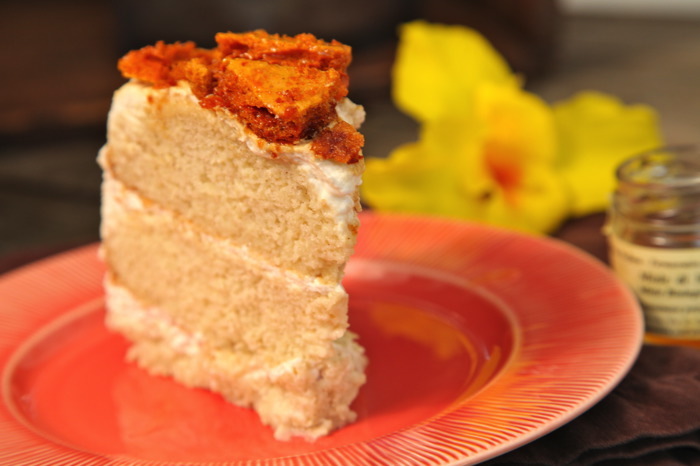 His b-day is coming up… I’m going to try your recipe this year, it looks fantastic! Thanks for sharing! OMG – my mouth is drooling and my blood sugar just went thru the roof from looking at the pictures!